Language Builder from Stages App Updates! The Language Builder from Stages app was released earlier this year to high praise from long-time Stages Learning Materials customers who were looking for a digital companion to the paper flash cards they love. The app has now been used in classrooms, clinics, and homes throughout the United States, and teachers, therapists, and parents have provided us with invaluable input about improvements to make the Language Builder app even better. Stages Learning Materials is happy to announce that version 1.1 has just been released for both the Basic and Pro versions with this customer feedback in mind! The latest version of the app has some great new features, including unlimited student accounts and record keeping capabilities to track student progress, and the Pro version now offers the ability to create your own flash cards. Your favorite language builder app has been updated and is now better than ever! The Language Builder from Stages app update allows a teacher, clinician, or parent to create an individual profile for each student they work with. 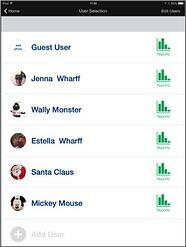 This allows for student-specific settings to be saved within each of the six activities for individual students, rather than changing the settings each time the app is used with a different student. This feature is available in both the Basic and Pro versions of the Language Builder from Stages app. 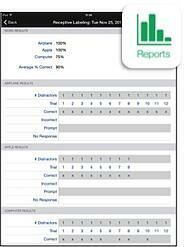 You can now also track individual students’ progress within the student profiles by using the reports feature. Reports provide information on how long it took the student to complete an activity, the number of targets and distractors used, details about prompts used, if any, and percentage correct for each target word. You can also track the student’s progress over time by looking at activities completed by date. This feature is available in both the Basic and Pro versions of the Language Builder from Stages app. Our most exciting new feature is the ability for teachers, clinicians, and parents to create their own flash cards. Does your student need to learn a word that isn’t available within the Language Builder from Stages app? No problem! 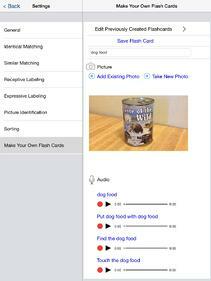 Now you can make your own flash cards by taking a picture of the object your student is working on, recording the corresponding audio, and using it within the Receptive & Expressive Labeling, Picture Identification, and Sorting activities! Not only does this feature allow you to create flash cards for words that are not available in the app, but you can also create flash cards for words other than nouns. The Language Builder from Stages app is based on the Stages Learning Materials Noun Cards, so the words in the app are all nouns. However, if you are working on other parts of speech with your students, such as verbs, you can now create your own verb cards using the Make Your Own Flash Cards feature. Another option for the Make Your Own Flash Cards feature is to label and record audio for the photo in a language other than English. In this way the Language Builder from Stages app can now be used with students whose primary language is not English, or for students who are learning a new language as well! The Make Your Own Flash Cards feature is available only in the Pro version of the Language Builder from Stages app. In order to utilize these new features, be sure you’ve downloaded the most recent version of the Language Builder from Stages app in the App Store. Updating the app will also ensure that it runs smoothly. Some users have reported that the app is freezing or crashing while they are using it, issues that are often resolved by updating the app. Be sure to let us know what you think about these updates, or if you have ideas about other features you would like to see, by emailing us at info@stageslearning.com. At Stages Learning Materials we are committed to providing our customers with the best tools available, in both print and digital formats, to help their students succeed. Your input allows us to continue creating products that meet your needs, as a teacher, clinician, or parent, so that together we can continue to make the most of every stage of your students’ learning and development. Don't have the Language Builder from Stages app? Learn about all that it has to offer by clicking below! Building Language: What Does the Research Say?